If you're more excited to head back to the Chernobyl Exclusion Zone than into space, maybe get more excited about space real quick. Activision confirmed in an official FAQ that Call of Duty: Modern Warfare Remastered will be sold strictly as part of Call of Duty: Infinite Warfare's special editions. Modern Warfare Remastered is a visually modernized version of the influential 2007 shooter, with improved models, lighting, and even animation. Fans have been clamoring for a remake of Modern Warfare (and Modern Warfare 2) for years, so I can understand why they might be disappointed that they'll only be able to get it as a bonus with another game. Furthermore, it isn't included in the standard $59.99/£54.99 Infinite Warfare package. You'll have to drop a minimum of $79.99/£79.99 on the Legacy edition to snag Modern Warfare Remastered. However you get it, the remastered shooter will be included as a separate download, not as part of the main physical or downloadable package. 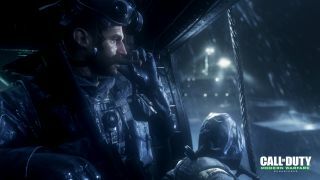 Activision may elect to sell Modern Warfare Remastered on its own sometime after Infinite Warfare comes out, but that isn't in the cards for the moment. And as for a Modern Warfare 2 remake, it's pretty easy to imagine it being exclusively bundled with a future Call of Duty game as well - assuming Activision finds success with this offer.